Geneva – IOM, the UN Migration Agency, reports that 42,845 migrants and refugees entered Europe by sea in 2018 through 24 June, with just over 38 per cent arriving in Italy and the remainder divided almost evenly between Greece (30%) and Spain (31%). This compares with 85,751 arrivals across the region through the same period last year, and 215,997 in 2016. On Monday, IOM Rome’s Flavio Di Giacomo reported that some 330 migrants remain stranded on two boats in the Mediterranean after Italy denied the NGO ship Lifeline, which reportedly has over 220 migrants on board, entry to an Italian port. A second boat, the Danish cargo vessel Alexander Maersk, which rescued 113 migrants two days ago, also was not granted permission to dock in Italy. IOM staff in Italy reported this morning that the Alexander Maersk has been eventually authorized last night to land in the Sicilian port of Pozzallo, while the NGO ship Lifeline is still at sea. By late Monday Italian authorities had only allowed the disembarkation of five vulnerable migrants. IOM Libya’s Christine Petré reported Monday that since IOM’s last update on 22 June, 1,234 migrants have received emergency assistance after being returned to Libyan shore by the Libyan Coast Guard. She reported that on late Friday (22 June) 100 migrants (99 men and one boy) – the vast majority from Bangladesh and the rest from Sudan – received food, health care and protection support including psychosocial first aid at the disembarkation point in Tripoli after being returned by the Libyan Coast Guard. The migrants embarked on a rubber boat in Qaraboli. All migrants have been transferred to Tajoura detention centre. On Saturday (23 June), 25 migrants (16 men, six women and three children) from Côte d’Ivoire, Guinea and Senegal received food, health care and protection support. All were transferred to Trig al Seka detention centre. On Sunday (24 June), 97 migrants (54 men, 17 women, 26 children), from Eritrea, Ethiopia and the Gambia received food, health care and protection assistance at the disembarkation point before being moved to Tajoura detention centre. Although no remains were recovered, survivors affirmed that four fellow migrants are missing. Late on Sunday, 490 migrants (395 men, 75 women and 20 children) received food, health assistance (eight women were pregnant and received primary health check-ups and additional three cases needed medical treatment on site) and protection screenings at the disembarkation point. Migrants were on four rubber boats and departed from Garaboli and Al Khums. The migrants were transferred to Trig al Seka detention centre. Later that same day, 361 migrants (229 men, 88 women and 44 children) received primary health care including five cases who suffered from severe dehydration after being returned by the coast guard. Migrants were taken to Al Khums detention centre. Overnight, 161 migrants (137 men, 20 women and 4 children), a large majority from Sudan, received health assistance (one pregnant case and four passengers required medical treatment onsite) and protection assistance at the disembarkation point after being returned to Libyan shore by the coast guard. All migrants have been transferred to Trig al Seka. In addition to those reported missing above, the remains of eight individuals washed up on Libyan shores over the weekend: six bodies were recovered in Al Maya and two in Sayiad. So far this year, 9,459 migrants have been returned to shore by the coast guard; this represents a slight increase compared to the same period last year (9,337 returned during the same period in 2017). IOM Athens’ Christine Nikolaidou reported that there were at least six incidents requiring search and rescue operations off the islands of Lesvos, Samos, and Kos. The Hellenic Coast Guard rescued 56 migrants off the island of Lesvos, 162 migrants off the island of Samos and seven off the island of Kos – a total of 225 migrants rescued and transferred to those respective islands. Another 203 migrants were reported on Chios and other islands, bringing to 428 the total number of arrivals between 21-24 June. Through that date the total number of sea arrivals to Greek territory since 1 January is 12,942 (see chart below). For the month of June, nearly twice as many migrants have arrived by sea to Spain than to Italy, nearly three times as many as have arrived in Greece. 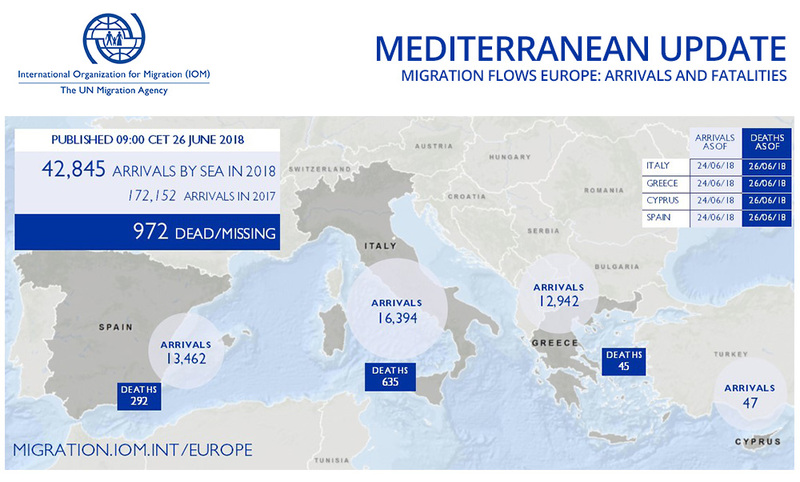 IOM Madrid’s Ana Dodevska reported Monday that total arrivals at sea in 2018 have reached 13,462 men, women and children who have been rescued in Western Mediterranean waters through 24 June. More than one-third of the total – 5,300 people – arrived only in the past 24 days. In the Mediterranean alone, 972 people have lost their lives at sea since the beginning of the year. There were two additions to the Missing Migrants Project database since last week’s update. On the Malawi/Mozambique border, 12 Ethiopian nationals died in a vehicle accident on 16 June. They were killed when the van in which they were travelling irregularly to South Africa crashed on Highway 304 near Tsangano, in Mozambique’s province of Tete. In Europe, the remains of a young migrant washed up on a beach in the Italian border town of Ventimiglia on 21 June. In recent years, Ventimiglia has become a common transit spot for migrants attempting to cross the border into France. In the first six months of 2018, at least 41 migrants have died while travelling in Europe. Download the Latest Mediterranean Update infographic here.